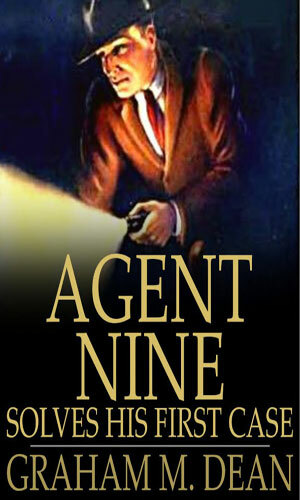 Agent Nine is an agent with the Bureau of Investigation. In the description of the organization to which Agent Nine belongs, it is written as the FBI but in fact, the recorded adventures took place just before the FBI came into existence. Its predecessor, known then as the Bureau of Investigation of the Department of Justice, had been operational since 1908 and was an integral part of the Department. It had yet to become the autonomous agency it has been for the past 80 years. 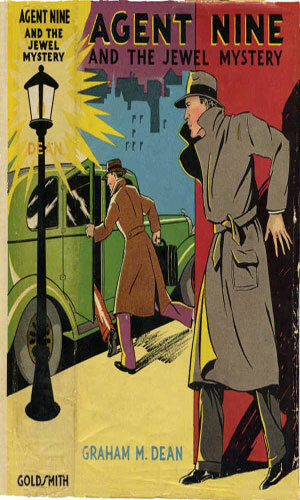 In fact, the two adventures that exist of Agent Nine were released the same year that a still youthful J. Edgar Hoover, fifth director of the BoI, would be authorized to reorganize that bureau into the Federal Bureau of Investigation. Agent Nine's real name is Bob Houston. When we first meet this young man he is a "youthful clerk in the archives division of the War Department". He entertained thoughts of a future in the Bureau but had not yet completed college so knew that he would not be accepted. Wanting, however, to serve his country in any capacity he could and, of course, needing some form of income, he applied to and was accepted by the War Department (prior name for the Department of Defense) to work in the archives. It is because of his job in those archives, a job which routinely entailed cataloging and storing all manner of plans and schematics for new armaments, that would get him connected to the BoI through his Uncle Merritt. Merritt Hughes was a "crack agent of the Department of Justice" and a hero and mentor of Houston. Since the last names were different, it is likely that Houston's mother was a sister to Hughes for though their surnames were not the same, it is stated that they looked close enough to be considered brothers (Hughes being several years older). It would be Hughes who, needing an "in" to the archives to solve a worrisome case, grabbed his nephew for help and in so doing, pushed him further down his career path. Agent Nine is described as around 5'10" tall weighing about 170 lbs. He has light hair and blue eyes and can be considered around 20 years of age. Bob Houston, Agent Nine, with the help of his Uncle and others solves the mystery of the missing Government Radio Plans that could be sold to a foreign power. Bob Houston, now Agent Nine of the FBI, is sent on a mission to stop some international jewel smugglers that operate between Europe and the United States. When I was first told of this series by a frequent contributor, I thought it a throw-back to a earlier time but written in the present. I vacillated reading it for a while but then forced myself to check it out and was surprised to find it was really quite old. Before I was born. That's very old. Bob Houston is a part of this compendium because with a moniker like "Agent Nine" he's pretty much have to be. Also once I read the first book, I could see that he was selected by his uncle to be an undercover investigator inside the War Department looking for secret-stealers which would make it a counter-espionage adventure. There is no doubt in my mind these stories were created for the young-adult market or at least less "sophisticated" (I hate putting it that way) tastes. The writing and the plotting and the characterizations are all simple and extremely straightforward and geared towards a lower reading level. Nevertheless, they are entertaining and worth a look. They are inexpensively priced on Amazon and at least one is available via Project Gutenberg for free.